What Causes Your Water Pump To Short Cycle? There are a number of things that can cause your water pump to short cycle. Short cycling, for all intents and purposes, refers to a water pump that turns on and off too frequently. This article will take a look at two of the more common causes of water pump short cycling and offer a brief overview of how one would go about fixing the problem. The most common cause of water pump short cycling is a loss of adequate air charge in the water tank. This problem is particularly common in those homes with non-bladder water pressure tanks that are older. The good news is that this particular problem is relatively easy to remedy. It involves repairing the water tank air volume control (if there is one), pumping air into the tank via the air inlet valve, and then draining the water tank. Once these steps are completed, you then need to allow air to enter into the tank again. Similarly, having too much air in the tank (overcharging) can also cause the water tank to short cycle. This can happen for a few different reasons, from overcharging when the tank is full to overcharging on an empty tank. Fixing the problem depends on the type of water tank you have. For bladder type water pumps, it is a matter of turning off the pump, draining the water and then resetting the air charge to the pressure specified by the factory. Another common cause of water pump short cycling is a blockage in the water supply piping, such as a clogged water filter. Even a water filter that is only somewhat clogged can cause short cycling. 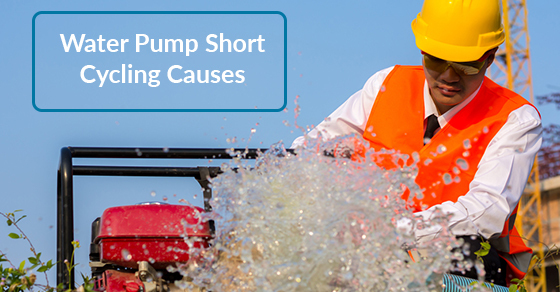 The blockage causes water pressure to rise quickly once the pump is turned on. If this is the cause of the short cycling, a new cartridge needs to be installed. If you are in need of first-rate professional plumbers to repair your short cycling water pump, contact our team of experts at Brothers Plumbing today. We are one of Toronto’s leading plumbing providers, with over 50 years in the industry, and we offer affordable rates.